Students Mary Dindal and Jeff Mitchell shadow horticulturist Brian Heap (left) at the Pittsburgh Botanic Garden. Students taking the botany course taught by Matthew Opdyke, Ph.D., associate professor of environmental science, recently stepped out of the classroom and literally "into the field" for their shadowing assignments. Splitting up in pairs, the botany students spent a day with professionals at various sites including the Allegheny Land Trust, Pittsburgh Parks Conservancy, Phipps Conservatory and Botanical Gardens, Carnegie Museum of Natural History, Pittsburgh Botanic Garden, and the Tonsor Laboratory at the University of Pittsburgh. 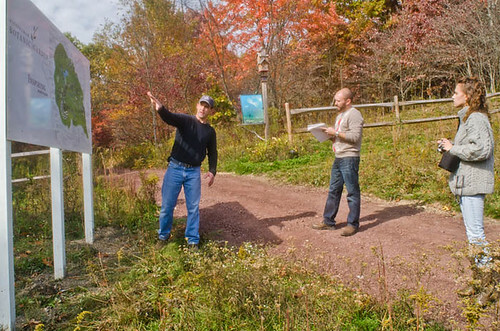 "Shadowing experts in the field is an excellent way for students to test their career goals by seeing 'a day in the life' of an environmental professional," explained Opdyke. According to Opdyke, the shadowing assignment is designed to broaden students' knowledge in the field of botany and introduce them to professionals working in successful, challenging careers. Students had the chance to talk with professionals about related positions, local environmental organizations and the job market. "I enjoyed touring Schenley Park and learning about what the Pittsburgh Parks Conservancy does for local parks," remarked Ingrid Reiland, a biological sciences major with a concentration in environmental science. Reiland's shadowing partner Jade Musselman, a secondary education biology major, enjoyed learning about plant diseases that are plaguing Pittsburgh's parks and what the conservancy is doing to help. Mary Dindal, a funeral services major who shadowed horticulturist Brian Heap at the Pittsburgh Botanic Garden, said: "It was very exciting to see first-hand how an area that was devastated by mining operations is now becoming a thriving environment again thanks to a dedicated staff." Heap spoke to the students about how his organization is trying to balance the ecosystem there by removing invasive plants. "By planting native trees and shrubs we are providing a food source for insects, birds and mammals," he explained. Photojournalism major Rebecca Lessner toured the Carnegie Museum of Natural History and learned about how museums share and "gift" specimens internationally.